TOKYO – Asian shares rose to one-year highs, expanding their gains this year to almost 10 percent, supported by a jump in oil prices and investor expectations of an extended phase of easy monetary policy around the globe. MSCI’s broadest index of Asia-Pacific shares outside Japan edged up 0.1 percent, bringing its gains so far this year to 9.8 percent. Japan’s Nikkei shed 0.3 percent. On Wall Street on Monday, S&P 500, Dow and Nasdaq stock indexes all closed at life-time highs, gaining 0.3 to 0.6 percent. Brazilian shares also hit two-year highs, helped by higher oil prices. Oil prices hit one-month highs on Monday, gaining 10 percent or more in a three-day rally as speculation intensified over potential producer action to support prices amid a glut of crude. Russian Energy Minister Alexander Novak said on Monday his country is consulting with Saudi Arabia and other producers to achieve oil market stability, bolstering hopes that oil producing nations could take action to stabilise prices. The market started to rally on Thursday after Saudi energy minister said non-members and members of the Organization of the Petroleum Exporting Countries (OPEC) are to meet on the sidelines of the International Energy Forum, which groups producers and consumers, in Algeria from Sept. 26-28. Brent crude traded at $48.01 a barrel, down 0.7 percent from Monday but still not far from Monday’s high of $48.46, its highest since July 12. Brent has gained more than 9 percent cumulatively since then. Since the start of August, it has risen more than 13 percent. In currencies, the dollar slipped slightly but was broadly stuck in its recent trading ranges as market players look to the minutes from the Fed’s July policy meeting, due on Wednesday. “At that meeting, the Fed revised up its view on the labour market and said risks to the economy diminished. So markets will be keen to see what discussion they had on future rate hikes,” said Masahiro Ichikawa, senior strategist at Sumitomo Mitsui Asset Management. Although Fed officials have said a rate hike is possible by the end of year, investors are not convinced the Fed can raise rates this year at all given the fragile global economic outlook. Its December rate hike was the first in almost a decade. 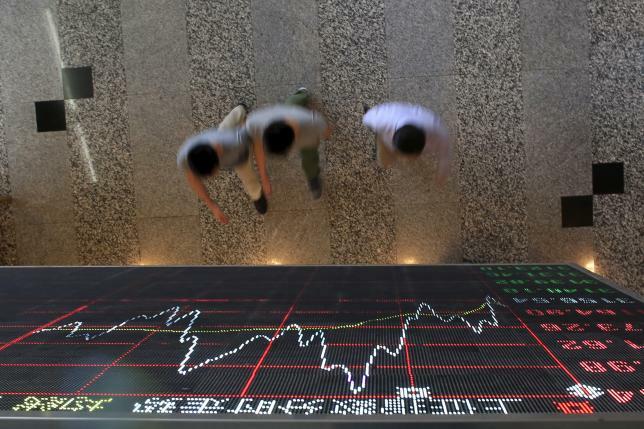 Most other countries are easing their monetary policies, with Britain, Australia and New Zealand cutting rates in recent weeks and Japan stepping up its purchasing of exchange-traded funds. These measures pose a risk that any Fed tightening could strengthen the dollar to an uncomfortable level for US companies and policymakers. Fed funds futures are pricing in only about 50 percent chance of one rate hike by December. The dollar’s index against a basket of six major currencies stood at 95.51, down 0.1 percent on the day after having slipped 0.1 percent on Monday. The euro fetched $1.1186, off last week’s high of $1.1222. The yen rose 0.6 percent to one-month high of 100.60 to the dollar.